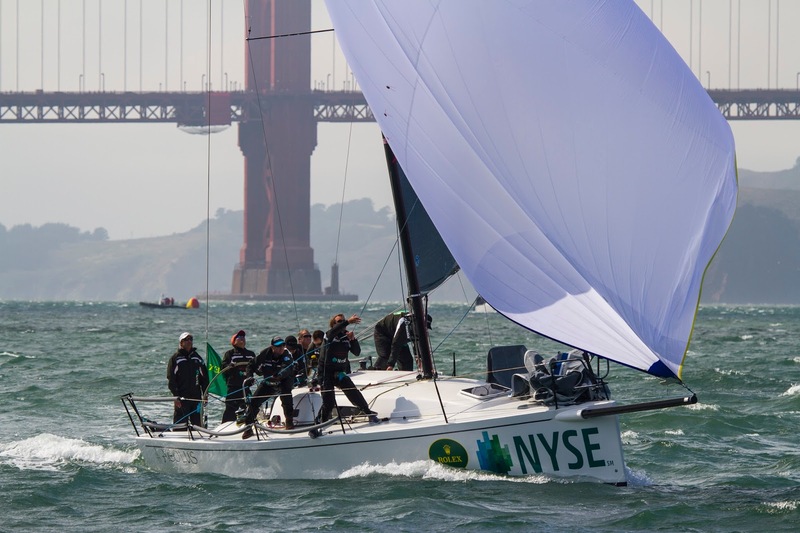 Specially designed water bottles will be supplied to every crewmember sailing in San Francisco’s largest regattas of the season in an effort to eliminate plastic waste. Whitecaps Marine Outfitters has partnered with the St. Francis Yacht Club in an effort to completely eliminate plastic waste in San Francisco Bay. 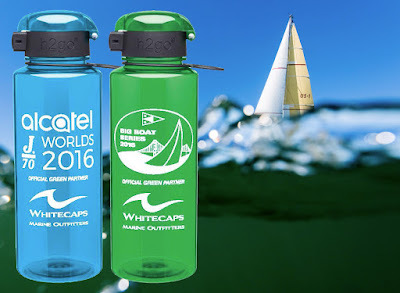 As the official green partner of the club’s two biggest regattas of the season—Rolex Big Boat Series (Sept. 15 – 18) and Alcatel J/70 Worlds (Sept. 24 – Oct. 1)—Whitecaps will supply every crewmember with a reusable water bottle. St. Francis Yacht Club will provide refill stations at the top of the docks. 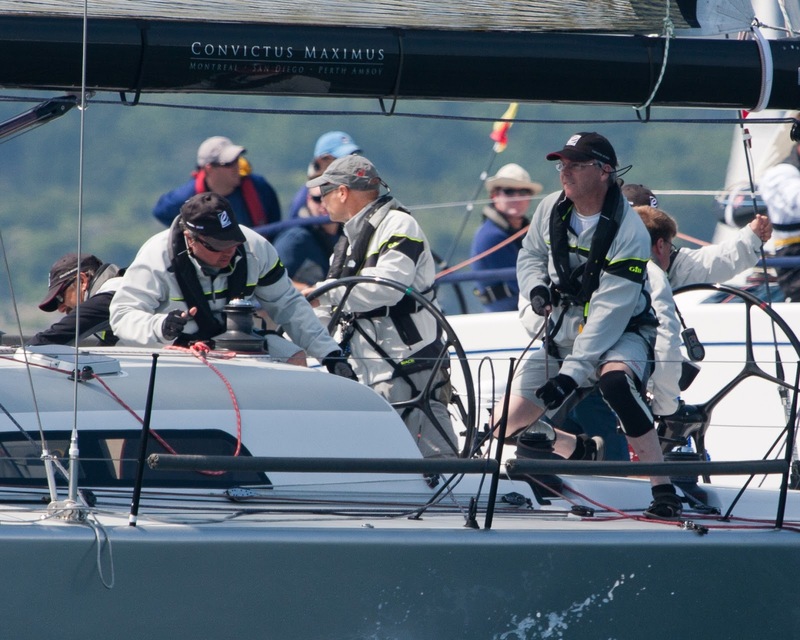 The 2016 Rolex Big Boat series boats a record number of entries—currently more than 120 boats—and the third-ever J/70 World Championships will have at least 81 boats on the line. With more than 1,000 sailors participating in both events, if every crew fully utilized their reusable water bottles, that could add up to several thousand bottles saved in the course of the two events. According to The Ocean Cleanup project, some eight million tons of plastic enter the world’s oceans each year, with trash accumulating in five ocean garbage patches—the largest one is between Hawaii and California. In 2015, a number of San Francisco-based boats participated in the Mega Expedition, the largest ocean research expedition ever—30 boats mapped a 3.5 million-square-kilometer area of the Pacific Ocean. The samples are still being analyzed, but initial findings show that the concentration of plastic had been heavily underestimated. “In San Francisco, we’re keenly aware of the plastic waste problem in our oceans. Many sailors in this year’s Pacific Cup and last year’s Transpac reported seeing numerous large plastic objects floating in the so-called ‘Pacific Garbage Patch,’ but the problem isn’t the plastic we can see—it’s the microscopic plastic particles we can’t see,” said Whitecaps owner Jen Canestra. “While saving a few thousand plastic bottles from the garbage bin is but a symbolic gesture toward solving this massive problem, we believe it’s important to take these small steps and to set the precedence in our yachting community. 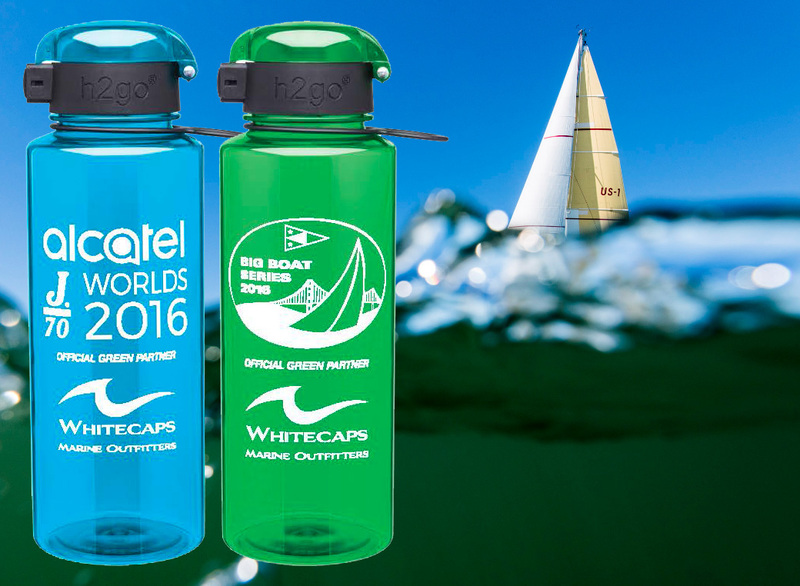 We urge every sailor to utilize their water bottle for the good of our sport and our planet,” she added. The 28 oz. H2Go water bottles with a convenient flip lid custom printed with logos of the event will be a great souvenir as well as help to reduce plastic bottle waste. The club is also launching additional efforts to reduce waste during these two high-profile events: sailing instructions, results, and NORs will be issued digitally. During social events, all cups will be biodegradable and food waste will be composted. 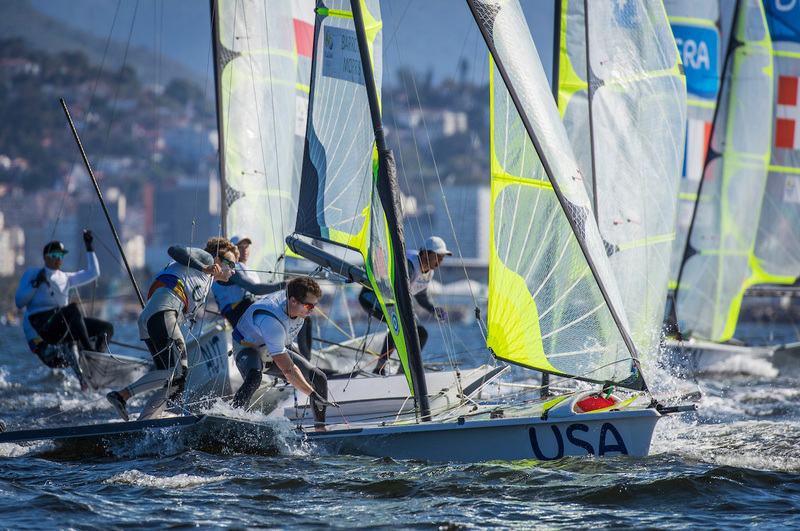 Joseph Morris and Thomas Barrows represented Team USA in the 49er skiff in Rio di Janeiro. 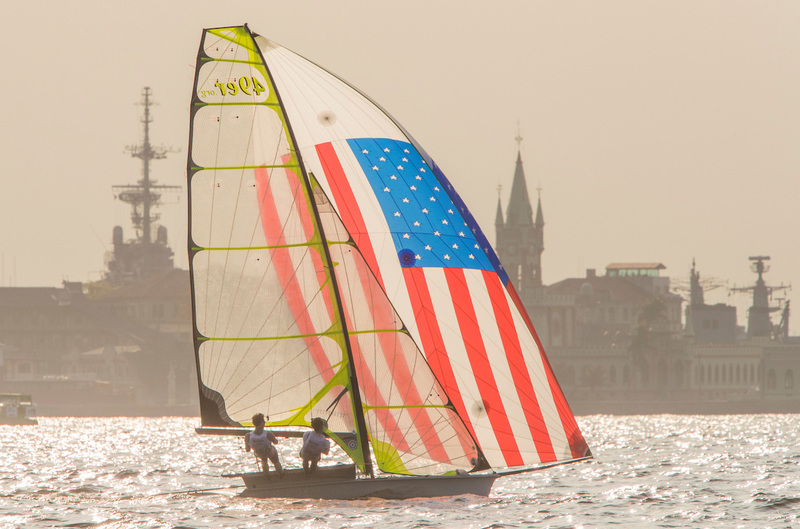 US Olympic 49er sailors Joe Morris and Thomas Barrows give us the low-down on how they decided who got to helm, the new Zhik Avalare gear, and the likelihood of a Tokyo 2020 campaign. 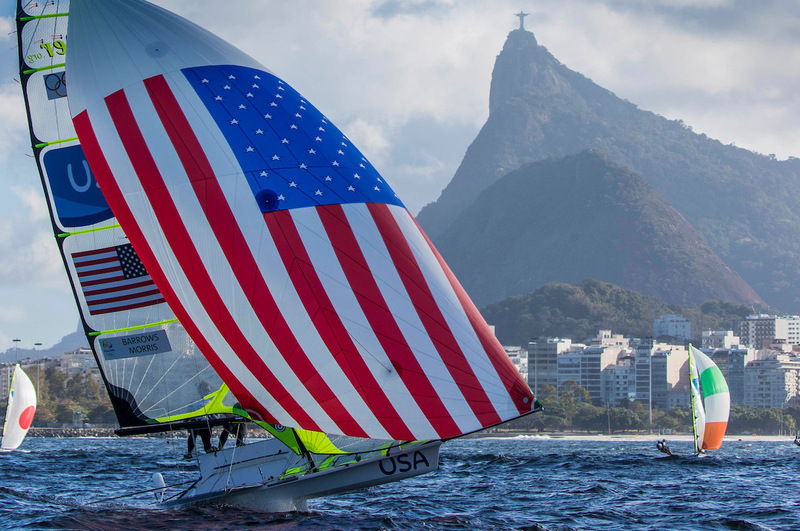 Whitecaps Marine Outfitters was proud to support US 49er sailors Joe Morris and Thomas Barrows on their road to the 2016 Olympic Games in Rio di Janeiro. 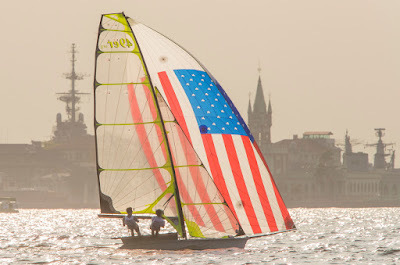 Even though the games are over, their schedules are just as busy with a new Melges 20 team, Joe getting ready to coach at Yale (their Alma Mater) this fall and Thomas preparing for the J/70 Worlds in San Francisco. 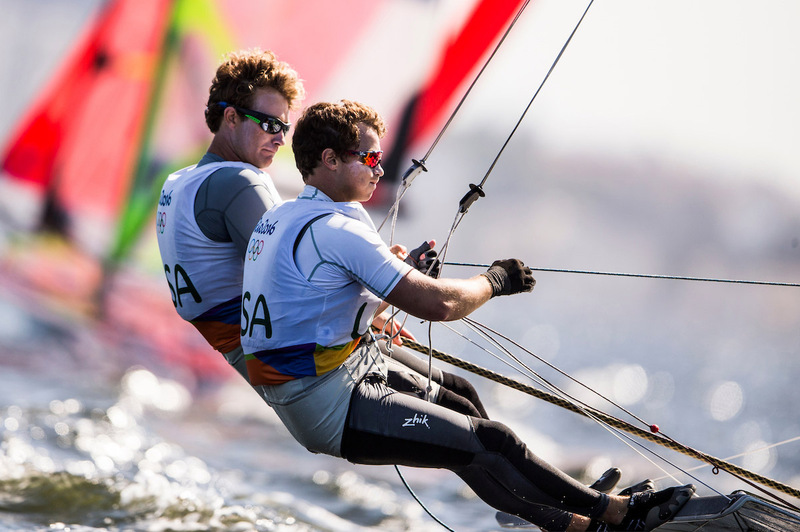 But we were able to catch up with them via email to learn about their experience in Brazil and find out what else is next for these two up-and-coming sailors. 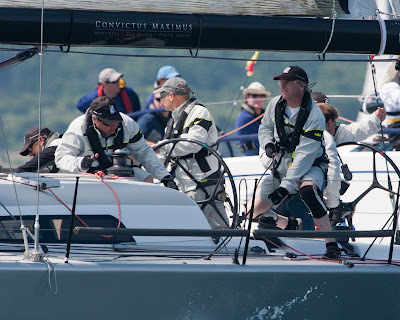 Whitecaps: You met when you were both sailing as helmsman, but when you teamed up to sail the 49er, one would have to drive, one would have to crew—was it an obvious choice who would do what position and how did you decide? Joe & Thomas: We get this question a lot. There were a number of pros and cons to each. Both Thomas and I were helms in our previous Olympic class experience—Thomas in the Laser in 2008 representing the US Virgin Islands and Joe on the US Sailing team helming in the 470. Thomas had been helming the 49er for about 18 months with a crew from the Virgin Islands when we teamed up. Joe was coming from working a desk job in Switzerland and wasn’t nearly in good enough shape to crew in the 49er at first so at the beginning, we traded off the helm, but Joe had a good amount of experience trapeze crewing while growing up and with Thomas’s experience on the helm of the 49er, that seemed to make the most sense. We moved out to San Francisco to challenge ourselves in the windy conditions while also running Joe through a 49er fitness bootcamp. With a lot of hard work in the gym, and an insane amount of food, after about seven months he’d put on 25 pounds to become a more efficient crew and Thomas got a lot more experience in breezy driving. In the end, this was a great strength of ours in the windy races during the trials. Mark roundings were crowded in such a tight Olympic fleet. Whitecaps: For Thomas, this was your second Olympics, for Joe your first—how were your perspectives and expectations for the Games the same or different? Joe & Thomas: We talked a lot about this and in short, it really wasn’t very different for us. Thomas had experienced the circus that is the Games and Joe had not. Some people feel the pressure when they are looked at as contenders; for us, it was pretty easy to put the headphones in and just go do our jobs each day. It is a very special feeling because everyone recognizes that you are there to be professional and do your job, and sometimes that goes unrecognized in Olympic sailing. Whitecaps: Besides Olympic qualification, what has been your greatest success to date (individually and together)? 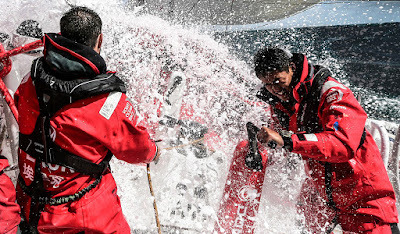 Joe & Thomas: It’s funny—after doing an intense campaign in an extreme class, all the things that rush to mind are small victories, for example, the days when you’re not just able to survive in survival conditions, but actually start racing with the big dogs in the fleet. In terms of more concrete success, we won a J/70 East Coast Championship, which we were using mainly to work on our communication in a less stressful environment; our communication in the 49er was much more concrete after that. Individually, we were both four-time All Americans at Yale. Two of those years we overlapped, which laid the foundation for our friendship and our professional relationship. Joe and Thomas say their time spent sailing together at Yale laid the foundation for their friendship and professional relationship. Whitecaps: What has been the toughest hurdle on you “Road to Rio”? Joe & Thomas: Our campaign was different than many in the sense that we basically ran on a shoestring budget from 2013 – 2015. Just having enough money to eat and train was a massive financial challenge, not to mention doing the full circuit of events in Europe. We had to take a lot of time off to do other sailing events in order to pay for the 49er campaign, which kind of held us at a plateau for a frustrating amount of time. After taking time off for an injury and using it to fundraise, we were able to hit the gas hard 2015 and sail full time like the other teams. We managed to scrape together enough money for a new boat for the trials. Funding is always a challenge for everyone, but without sponsors such as Whitecaps, who helped provide us with gear that we never would have been able to afford, the campaign wouldn’t have gotten very far. That being said, the struggle made us a whole lot stronger in the end, although maybe not as prepared for the Olympics as we would have liked. Whitecaps: You were wearing Zhik gear in Rio including the new Avlare. How do you like it? Joe & Thomas: The new Avlare line was fantastic. To sum it up in one word: versatility. We were amazed how well it performed on light, sunny, and flat water days inside the bay as well as breeze on, wavy, windy days out in the ocean. The Z Skin tops were also a favorite of ours. Everything they make is great, and it’s literally the only brand in our kit. On behalf of our team, we just want to say a HUGE thank you to Whitecaps Marine & Zhik for their support over the past several years. We cannot say thank you enough for keeping us in the right gear to perform on the biggest sporting stage in the world! Whitecaps: What was it like to pop that huge American flag spinnaker for the first time? Joe & Thomas: We just couldn't stop smiling. I (Joe) had the picture of Erik Storck and Trevor Moore sailing with that kite in 2012 as the background of my computer for four entire years—I’m still staring at it right now. It just perfectly symbolized what the Games are all about. We were representing our country to the best of our abilities, and it really fired us up in a good way. Joe and Thomas say that huge American flag spinnaker perfectly symbolized what the Games are all about. Whitecaps: Before the Games, you both said that you’re committed to winning a gold medal in the 49er in Brazil, but sailing is a fickle sport—anything can happen—what final steps did you take to prepare and are you satisfied in the end with your result? Joe & Thomas: Looking back as the dust is settling after the Games, it’s a mixed bag of emotions. We did not have a stellar performance, but having reflected on it a bit now, we may not have made any major changes to our approach in the final few months. We were behind the international curve once we qualified but showed that we could race in the top 20—and almost top 10—at major World Cup events. The Olympics is only 20 boats but it’s just as hard to pass from 20th to 19th as it is from 2nd to 1st—the level is so high and the class so deep. Our starts, which are usually a big strength and something we rely on, weren’t stellar, and a bad break here and there caused us to be behind from day one. We’re both still proud of how we sailed, know that it could have been better, and are taking some time to analyze the small things we could have changed during the event that would have helped us to a better performance. The learning never ends in sailing and when you have a poor regatta is when you can learn the most. Whitecaps: 49er racing began in the second week of the Games and athletes typically can attend any of the events they would like as spectators—did you have an opportunity to watch any of the other competitions? Joe & Thomas: Aside from the Opening ceremonies, watching other sports was the biggest highlight. Seeing all the diversity—the different body types, techniques, powerhouse countries, small island nations, people who excel under pressure and those who crumble—it was just amazing. We saw everything from diving to wrestling, beach volleyball (another highlight) to tennis. It was an experience we’ll never forget. Whitecaps: What’s next for Team Barrows-Morris? Can we expect to see a run for Tokyo in 2020? Joe & Thomas: As for our team, we are taking a little bit of time to reflect and do some soul searching. If we go again for 2020, the mission would be a medal and nothing short of it. We’re spending some time doing other sailing (Melges 20, J/70) and are planning to talk about our Olympic sailing futures in a few weeks. Whether it’s 49er sailing or not, we will definitely be working on some projects together for the future. Did you know you can get a great brand-name technical shirt with your boat’s name and logo on it for just a few dollars more than the cost of the garment? It’s hard not to admire a crew in good-looking gear. Unless you’re the boat owner, and then those royal blue polos and khaki sailing shorts embroidered with the boat name and three-color logo look—expensive. When they start pulling on their matching foul weather gear, you just walk away. Or do you? Custom team gear isn’t as expensive as you think. There’s a variety of ways to put a logo on a shirt, and most items can take a logo. That means you can choose a brand-name shirt and put your boat’s logo on it for just a few extra dollars. Buy items in bulk, and the total cost could be little more than the retail cost. Still not sold? 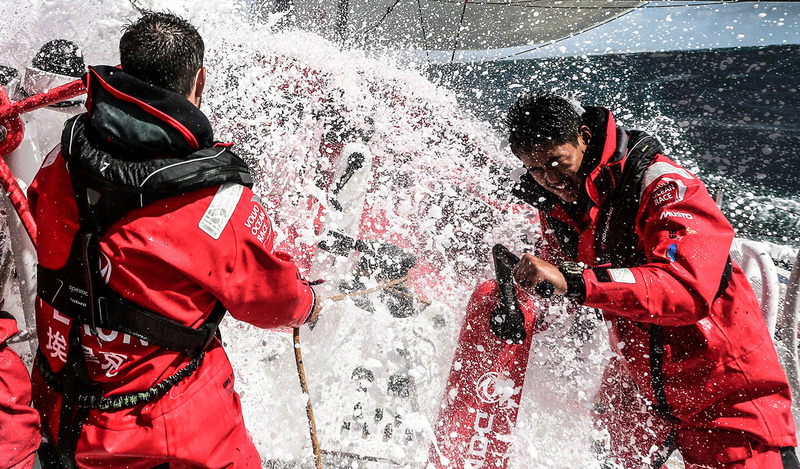 Here are three more reasons why you should get team gear for your crew. Sailing is a team effort and choreography is critical. The longer your crew sails together, the better the effort and choreography will be. A great way to ensure that your crew continues to sail with you is by making them feel like they’re part of the team. And there’s no better way to get a group of people feel like they’re part of a team than by wearing a uniform. Have an intricate logo on your kite? Zhik’s ZhikDry shirts (in white or light gray) work great with dye sublimation—a process that embeds the color right into the fabric without impeding breathability. Your crew will look sharp and that will help instill in them a feeling of pride in your boat. While big budget programs will oven provide a long and short sleeve option, as well as a midlayer and a pair of shorts, if your program is one of more modest means, simply organize the gear—your crew will most likely be happy to chip in. Sailing is a lot about professionalism, even among amateur crews, and “ship shape” doesn’t only apply to the boat. Just like we coil the lines and flake the sails at the end of the race, we don’t want to show up at the party looking like a bunch of wet dogs—even if the conditions of the day might make us feel like one. The Henri Lloyd Fast-Dri Silver Polo is a great shirt for wearing off the boat and into the club, and it’s a perfect candidate for an embroidered logo or boat name. Get the black shirt, and you won’t even have to worry about your crew getting it dirty. Or, order the white shirt and have them keep it to throw on after the race is over. There’s little personal glory to be had in a winner take all sport like sailing—your crew pours their hearts and souls into your boat all season long for little more than a cold beer at the end of the regatta. Springing for a team shirt is a great way to say thanks to your crew for all their hard work. Even if it’s just a token item like the Henri Lloyd Fast-Dri Crew Cap with your boat name and sail number embroidered on it, your crew will know you enjoy sailing with them and appreciate all their effort. Custom team gear usually takes about three weeks for delivery. Visit the custom team gear page on our website for more information about processes, set-up fees, and cost-per-item charges. Safety at Sea instructor Paul Cunningham helps us to understand the differences between inflatable PFDs, and the pros and cons of manual and auto inflate models. As the old adage goes, the best PFD (personal flotation device) is the one you’re wearing. But when it comes to inflatable PFDs, the debate is far from settled as to whether manual or automatic is the way to go. “When choosing a life jacket, one should always consider how and where it is to be used,” says Paul Cunningham of SouthCoasting Navigators. Among his many nautical credentials, Paul is a frequent US Sailing Safety at Sea seminar leader and a Royal Yachting Association Yachtmaster examiner. “I would never recommend a type of PFD or activation; what I do always recommend is that everyone should do their own risk assessment—carefully,” he says. Paul says a thorough risk assessment should include (but is not limited to) how good a swimmer you are, how likely you are to be on deck alone, whether the type of vessel you sail is prone to capsizing or keel problems, the water temperature you sail in (water colder than 60˚F can instigate cold water shock, rendering a casualty incapable), and how likely you are to suffer a fall or get knocked down, either due to age or lack of balance. “Personally, I am quite strong with good balance, a strong swimmer who often sails high-performance vessels that could possibly capsize or suffer keel problems. I chose a manual inflation life jacket. My mother-in-law is a poor swimmer, often suffers falls, isn’t very strong, and is prone to panic. I say she doesn’t need a PFD, but my wife insists that she wears an auto inflate model. My wife is fit and a good swimmer, she sails J80s midweek and cruisers on weekends. She has chosen a lifejacket that is easily converted from auto to manual and back, complete with a tag to show which one it is conforming to at the time,” he says. Here, we take a look at how inflatable vests work and the pros and cons of both manual and automatic PFDs. A PFD can save your life even in good weather. Every inflatable PFD has an inflator mechanism that triggers a carbon dioxide cylinder to fill the bladder with air. Manual PFDs inflate when you pull the “jerk tab,” a yellow handle that dangles at approximately waist height, which pierces the CO2 cylinder. An automatic PFD will inflate when the water-soluble bobbin comes in contact with water releasing a spring-loaded pin that punctures the CO2. The newest form of automatic inflate PFDs are triggered with a hydrostatic pressure valve, which is only triggered when immersed in a certain depth of water (the actual depth needed to trigger the valve varies by manufacture). 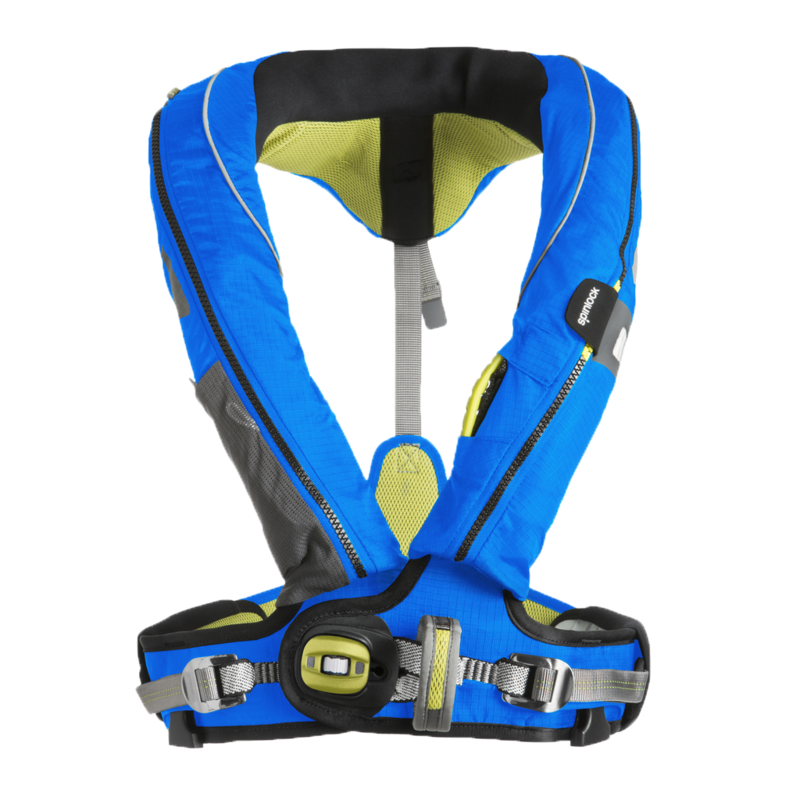 There are four ISO levels for PFDs: 50, 100, 150, and 275 newtons of buoyancy. Recently, the USA agreed to recognize the ISO system, which makes life easier for people who sail or race in different areas around the world since the our chosen PFD will meet requirements everywhere. Inflatable PFDs are also designed to right a wearer who is face down, putting them onto their back so that they can breathe. Automatic inflation occurs when the PFD gets wet, so if the user is incapable of activating in a timely fashion the device will still inflate and support. Many people say this is advantageous if knocked unconscious, but the real advantage is due to incapability caused by cold water shock. On the other hand, more than one automatic PFD has inflated while the wearer was working on the bow, or even just sitting on the rail. If you’re on a very wet boat in big breeze or in pouring rain, you won’t want to have a traditional auto-inflate vest on. If you do want the benefits of auto inflate without the risk of it going off under a wave, a hydrostatic PFD is a good option because it won’t inflate just by water contact, but requires you to actually be in the water to activate. Hopefully, cost isn’t an issue when determining the best equipment to help save your life, but it is worth noting that rearming a hydrostatic life jacket—whether it’s been used or is simply past its expiration date—is significantly more expensive than rearming a traditional auto-inflate or manual PFD. 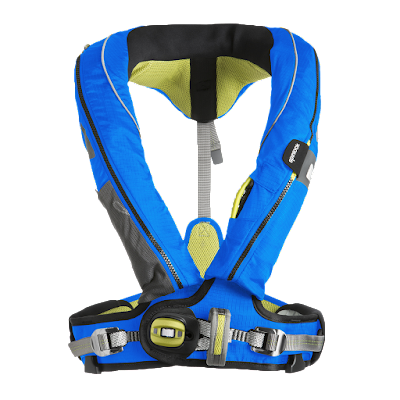 The Spinlock 5D Pro Sensor is a complete lifejacket system with a Pylon Light, sprayhood, thigh straps, and a built-in safety line cutter. The 5D uses a water-activated auto inflator designed so that only water flowing upward through the unit will cause it to inflate. Prefer a manually inflated vest? No problem—just use the Manual Conversion Kit! “When using a manual inflate live vest, the wearer has complete control over the inflation of the PFD and chooses when to inflate it, reducing the possibility of unwanted inflation or entrapment,” says Paul. There is absolutely no chance of a manual inflate vest going off when you don’t want it to, so if you sail a small boat like a J/70 or in an area with regular rain showers, manual maybe be the way to go. Also, manual inflate PFDs generally require less servicing than auto-inflates vests. However, in order for the vest to inflate, the wearer must be conscious and physically capable of pulling the cord. Manual inflate vests are not recommended for people who don’t know how to swim or for children under 16. Another drawback to the auto inflate PFD is the rare occasion where you’re in a serious boating accident and you find yourself trapped under the upturned hull and unable to get out because you’re life jacket has inflated. Your only options to get out are to take the vest off (not recommended) or to deflate the vest using the valve, swim out, and then manually blow it back up again (highly taxing). The hydrostatic vest probably won’t prevent this scenario because you’d likely be submerged deep enough during the event that the vest would inflate. However, it’s important to know that while manual vests can’t be converted to automatic, automatic vests CAN be converted to manual inflate using an adapter kit. It’s not something that can be done on the fly, but it isn’t very difficult either, and the automatic to manual switch could be achieved if building conditions suggest it would be a good idea. Whichever type of activation you chose for your PFD, “it will be of little use if it is not fitted with a strong harness, a spray hood, and crucially a crutch strap or leg straps,” Paul says. A tether, water-activated light, reflective markings or tape, a whistle, and safety knife should also be attached to it, as well as a PLB or SART in some cases. Paul’s Tip: For all things safety, consult the ISAF Offshore Special Regulations on the World Sailing Web Site.